Are you afraid about the heat in summer? Do you want to know about the ways to stay cool even in hot summer days? Yes, it’s true that you can’t wait until winter to make yourself cool. You have to beat the heat in one or the other way in order to carry out your routines. Here are the ways for you to beat the heat during summer. 1. Stay Away from Sun: Is it not sounding so simple? But, everyone is not doing this. You should try to stay away from sun as much as possible until at least 5 pm. This will keep you cool and at the same time you will be protected from worst sunburns. Yes, seek out for the shades or try to stay indoors right now! 2. Start Early: During summer, you must make sure that you start your day very early. Try organizing your trips to banks or supermarkets as early as possible in the morning before the sun shows out its real heat. And, your shops will be open in the evenings too. By planning this way, you can avoid boiling heat in the parking lots and inside shops. 3. Hydrate Yourself: This is the most important thing you should be following during summer. You must make sure that you drink plenty of water in order to avoid rapid loss of fluid. You must take more than 8 glasses of water in a day. You can also try out other beverages that are rich in electrolytes which will help in replacing the minerals. 4. Cold Showers: Showering with cold water would help in cooling down the core temperature of your body for sometime after you get out from the shower. 5. Cold Treats: Consuming cold treats like ice cream could bring you the delight during hot days. So, don’t wait. Fill up your refrigerators with the refreshing cold treats right away. You can beat the heat with this delicious stuff. 6. Cold Water Sprays: During summer, you can keep the cold water spray bottle with you all the time. This is a simple and effective way for lowering the body temperature by spraying yourself with the cold water. You must also make sure that you take a hand towel for wiping out the excess water. 7. 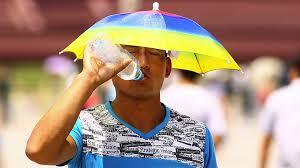 Wear proper Clothes: You must use proper and suitable clothing in order to beat the heat. Wear loose fitting and light colored clothing during summer. This is because they will reflect the heat and will help in maintaining the normal temperatures of your body. In contrast, tight and dark colored ones will tend to trap the heat and would keep your body warm. 8. Investment for Cooling: If you are living in a place where the temperatures go very high during summer, you must make a fair investment in air conditioning. The air conditioners are definitely worth in the long run. It is sufficient that you install the air conditioner in only one room. You can beat the heat in an efficient way. 9. Turn off Appliances: It is important that you turn off the appliances when not in use. This is because when the appliances work on electricity, they would tend to generate their own heat. Hence, by turning off all the appliances when they are not being used you can reduce the heat circulating within the particular area. 10.Stay Open: You can sleep with your doors and windows open during summer by making essential arrangements mosquitoes and security. This will give the cool breeze from outside to enter your rooms and you can sleep happily.